This section of AC contains information about reptiles. Here you will find information on how to care for these animals in captivity as well as about their life if the wild. Some of the animals you can find information about in this section are not suitable as pets, e.g. due to their size, toxicity or scarcity in the wild. Salamanders and newts are despite their similarity to lizards not reptiles but rather amphibians so if you’re looking for salamander and newt information, please visit our amphibian section instead. The same is true if you are looking for information about frogs or toads; they are also amphibians. Reptiles are a group of “cold-blooded” animals belonging to the class Reptilia. They breathe oxygen from the air and their skin is covered in scales or scutes. All reptiles, even the snakes, are tetrapods as they are four legged or have developed from four legged vertebrates. Reptiles can be found on all continents except for Antarctica. The science of reptiles is called herpetology. Reptiles reproduce sexually. Some reptiles, such as the Komodo dragon, can reproduce asexually though parthenogenesis (virgin birth). This is however only done in the absence of a suitable male. Most reptiles are egg layers but some give birth to live young. There are two different methods used by the species that give birth to live young. One is ovoviviparity where the eggs hatch inside the body before the young is born. The other methods is viviparity in which offspring are born without the use of a calcified egg. Those using the second method feed their young though various forms of placenta. The smallest known reptile in the world is Sphaerodactylus ariasae, a gecko species that reaches a length of no more than 1.6 cm / 0.6 in. The largest reptile species is the Saltwater crocodile (Crocodylus porosus) that weighs over 1 metric ton and can reach a length of 6 m / 20 ft. The first reptiles originated about 320 – 310 millions years ago during the late Carboniferous. The oldest reptile tracks ever found were discovered in Nova Scotia in Canada and are believed to be 315 millions years old. They are thought to have been made by a reptile called Hylonomus, the oldest known true reptile. Hylonomus was a small, 20-30 cm (8-12 in) long lizard like creature that probably fed on insects. The true hay days of the reptiles were during the Mesozoic era, a.k.a. the Age of Reptiles. A mass extinction cleared the way for the reptiles to become dominant and some reptiles evolved into the famous dinosaurs. Another later mass extinction event would in turn make it possible for the Age of Mammals to follow; the age we live in today. 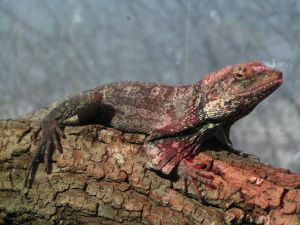 It should however be stressed that there are still considerably more reptile species on the planted than mammal species. Testudines: This order contains turtles, terrapins and tortoises. It is comprised of roughly 300 known species. Crocodilia: This order contains alligators, caimans, crocodiles, and gavials. There are a total of 23 known species. Squamata: This is the largest reptile order containing many times the number of the other orders combined. There are about 7,900 reptile species belonging to this group which contains snakes, lizards and worm-lizards (amphisbaenids). Spenodontia: This is the smallest reptile order and only contains two tuatara species found in New Zealand. These species are “living fossils” from an order that had its hay day some 200 million years ago. Both Spenodontia species are endangered.